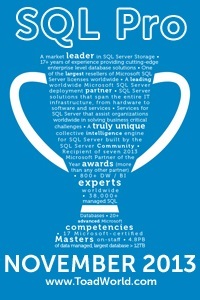 It is with a very heavy heart that I announce I will no longer be working with SQL Server. In fact, I’m leaving technology in general. With the support of my friends and family, I’ve decided to pursue a long-standing hobby and life dream. I’m sure many of you know that I live in Texas, home of the giant mosquito. In addition to that, I live near a large pond that is the perfect place to raise mosquitoes. Our current plan is to raise two distinct types. This type of mosquito has a very smooth gait and is perfect for both long-distance travel and a short buzz to the grocery store. They can even be ridden by children with a limited amount of training. They can also be trained to the harness to carry small loads. If you put in some extra effort you can sometimes train them to carry larger loads by working together. Not that this is overly surprising. Spend enough time in Texas and you’ll see the odd cow get carried off by a swarm of mosquitoes. This is the most common type of mosquito and is used by many Texans to guard their home from burglars and in fact any unwanted visitor. These mosquitoes can be trained to attack in formation and on command. When not on guard duty they are soft and cuddly pets as long as you keep them well fed. In order to maintain the highest quality, our mosquitoes will be given a large area to roam and only be fed with free-range vegans. Wish me luck on this new endeavor! « A transport-level error has occurred when sending the request to the server. Good luck friend! I wish you all the best in your new passion. Please notify me when the guards are on duty as I will pack my netting when I come to visit! You know, flea circuses have a better reputation. Just sayin’. To be fair we do have giant fleas in Texas, but have you ever tried riding one? All that bouncing makes me motion sick. This is the best April Fool I have seen. Kudos Ken! Thanks 🙂 Know any good vegans?